In 19th century Edinburgh, the idealistic young assistant (Russell Wade) of a renowned surgeon (Henry Daniell) is shocked to learn that a creepy coachman (Boris Karloff) who sells stolen cadavers occasionally resorts to murder to secure enough bodies. As Peary notes, this classy, “refreshingly literate” adaptation of Robert Louis Stevenson’s short story (based on the real-life exploits of notorious murderers Burke and Hare) presents a unique “Jekyll-and-Hyde variation”: one in which the war between good and evil “is between two men, ‘good’ McFarlane [Daniell] and ‘evil’ Gray [Karloff]”, each of whom possesses a good or bad side which he vehemently denies. 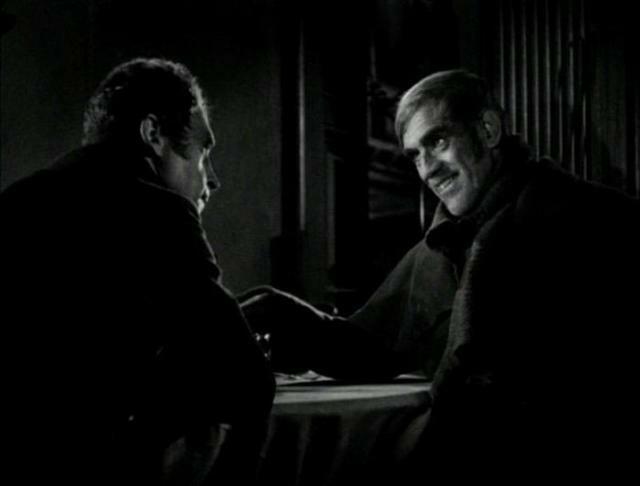 Indeed, it’s the complexity of the film’s two central characters which elevates The Body Snatcher well above its B-level status: we watch with fascination as Karloff (giving a stellar, nuanced performance) repeatedly torments McFarlane with hints about his sordid past, insistently reminding him, “You’ll never get rid of me.” McFarlane’s steadfast dedication to teaching young medical students about anatomy — which in turn requires a steady stream of “fresh” corpses to dissect — has caused him to breach the most important rule of ethics in medicine (“First, do no harm”), and the guilt he lives with because of this eats away at his very soul. Meanwhile, Gray remains unable to rise above his working-class status as a cabbie, but does everything in his power to remind McFarlane that they’re really cut from the same cloth: neither one is ultimately “better” than the other. As Peary notes, director Robert Wise does a “superb and tasteful” job depicting the horror elements of this “morbid”, highly atmospheric film, which remains one of producer Val Lewton’s most successful thrillers. P.S. 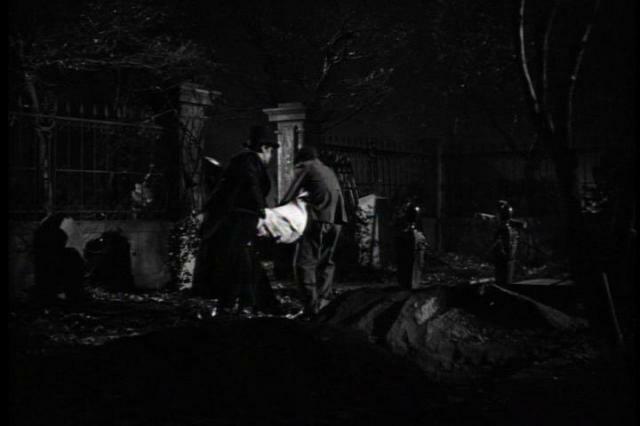 Peary also argues that the script is “in truth overwritten and dull in spots”, but I disagree; at just 77 minutes, The Body Snatcher moves along quickly and never feels stale. Yes, as one of Lewton’s best thrillers, and for Karloff’s career-worthy performance, which Peary awards the Alternate Oscar of the year. NB: He nominates Henry Daniell in the same category. A must – and in complete agreement here, even re: the feeling that the script is not overwritten or dull; the use of time feels right for the story being told and each scene seems necessary and only as long as necessary. A caveat, though – Peary’s praise of Wise’s direction notwithstanding, perhaps he somehow sensed what I do: Wise, a competent director if not particularly visionary, often leans toward the syrupy; a few such sequences slip in here but overall (and with Lewton’s obvious help) he knew how to keep things compact. I feel I should mention the Karloff/Lugosi scene as a standout. Reportedly they disliked each other (though did a number of films together) but you’d never guess it here; they’re a good team and their scene is a stunner. Lugosi is (refreshingly) allowed to stretch himself as an actor in this film but I can’t help but suspect that he resented Karloff’s range. Even in the thriller and horror genres, Karloff exhibited more variety of color.